I'm trying to break up these hiking posts into smaller parts rather than list four or so different hikes in one post. I hope this will make it a little less of a huge read each time. This has ended up being part of two series. You can find earlier parts of each in the right hand navigation. This route heads down through the mining town of Jinguashi to the coast. It roughly tracks the sites of the Benshan mine tunnels from number one to nine. 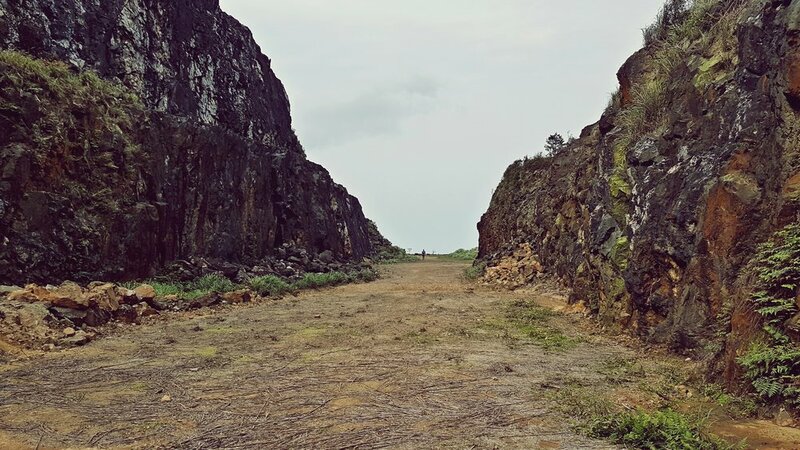 At the time of writing a new trail is being built near the abandoned Shuinandong Smelter flue tunnels but it is not fully opened. At the moment a useful tunnel is often sealed but on my trip workers let me through. I will keep this updated but it may be worth contacting a hiking organization or the local government prior to going. (I realize doing this is useless but it sounded good). 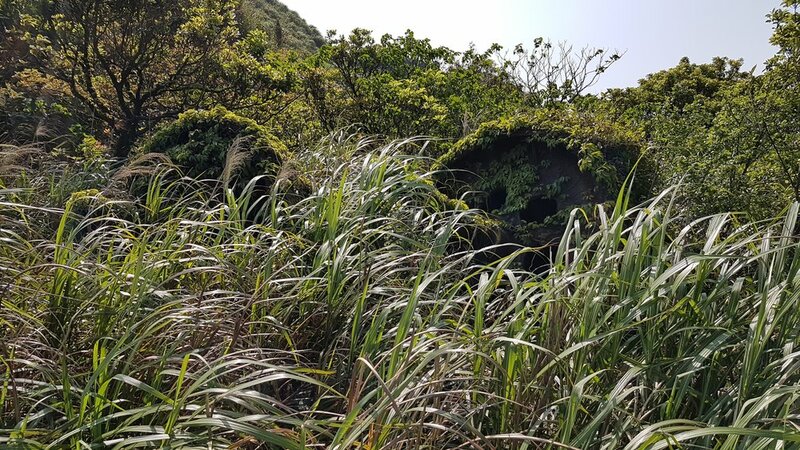 In any case it is still possible to reach the area down the old railway tracks and you would simply have to climb back up the trackbed to Jinguashi to get out. The route starts at the Caoshan Defense Road. This road is where every walk in Part 1 starts or ends. I recommend combining this trail with one of the others. Teapot and Banping would work well. For a long time I was only able to find Benshan Mines Numbers 4, 5, and 6. While searching online for Numbers 1 to 3 I found that there were originally 9 mines. Sadly only the middle three are really accessible. From Caoshan Road head to the signposted Benshan Geopark. This is a large former open cast mine. It's where the Benshan 1, 2, and 3 Mines were located before excavations destroyed them. The workings here shaved about 130 meters off the top of this hill. There isn't really anything at the far end of the mine but it's a lot larger than it appears in pictures. As you come out, turn right then left, and head down on the main path towards Jinguashi. Benshan open cast mine. The dot at the end is a person. On the way you'll pass some large old machinery and then the site of the Number 4 Mine. This mine entrance was buried by floods a long time ago. What's still accessible is a hoist room for a cableway. This transported material down the mountainside in little aerial tramway carts. One of the plinths that held supports for the cableway is also visible. Downhill is the 1933 Jinguashi Shinto Shrine ruin. Many Shinto shrines were destroyed by the KMT after the Japanese retreated and though the main building here is gone it's still a dramatic site. There's a little about the history of the shrine here. Some weathered steps head down into the Benshan Number 5 mine area, now known as the Jinguashi Gold Ecological Park. The ecological part of the name, as though it's a nature reserve, has always struck me as odd. Large scale mining and smelting was really an ecological disaster for the area with rivers left full of heavy metals. Entering the Benshan 5 Tunnel and a mock-up of a gold seam within. The gold park is pretty interesting to look around and you can go a little way into the mine tunnel on a short tour. A 220kg gold ingot is on display and there's a chance to try gold panning. The lower area of the site is a mix of Japanese era offices and wooden houses. The house built in 1922 for Crown Prince Hirohito's visit is a particularly fine sandalwood and cypress villa. Hirohito never visited Jinguashi however. This seems to be a common pattern regarding stuff built for him. The majority I've seen he never visited. The next target is the large temple (Chuen Ji Hall) with the statue of the God of War on the roof. There's either a wide trail to follow from just past the Number 5 Mine entrance or a walk down and through part of the village. The main village street is pretty and quiet and there's a memorial to Jinguashi's Prisoners of War just below the temple. This commemorates the captured allied soldiers who were forced to work in the mines here by the Japanese. The only shop is a small community store with a lot of retro-looking snacks. Follow the road past the temple and to the end of the long carpark. Perched on the edge of the road is a red brick ruin. This was the winch house for a chain railway that used to take miners from Jinguashi down a steep incline to the Benshan Number 6 Mine. I think most people passing this don't know they can head down it. Bear in mind that if the tunnel mouth is closed further down you'll have to head back up this later. Google misleadingly has a winding path on the map near to the railway. This path does not exist. At the bottom of the railway there are some small warehouses hidden in the forest and some larger mine buildings in a clearing. In the undergrowth straight ahead there's an extremely deep shaft. It's raised up a little so don't worry about falling in but it's probably not a good area to go traipsing around in the undergrowth here. A small tagged path on the left leads to the Gold Waterfall but this has been washed away. Instead pass the mine buildings and visit the sealed entrance of the Benshan Number 6 Mine on the right. This is where things get a little complex. There's a way to get on top of the concrete Shuinandong Smelter exhaust flues here. These are the longest flues in the world and have already been visible from a few points on this walk. They snake up the mountainside for hundreds of meters but are a little too steep to walk on. They used to divert toxic gases away from the settlements downhill. Don't go inside as there's still a concentration of dangerous substances within. There are three in total, with a few branches and stubs. The first was made with inferior concrete and has collapsed in many places. To reach them follow the tarmac road from the mine entrance past some building shells. Where the road has fallen away there is a small track though tall grasses that then rejoins the road. This track is short but very overgrown and the grass will cut you. Once on top of the flues I noticed what looked like a new trail being built. It seemed to follow the flues up the mountainside and also head down to the smelter. As I was aiming for the coast and had already walked from Mudan so I followed it downhill. In places the flues had been covered with paint. I expect this is to lock in toxic material. Frustratingly the trail ended in dense undergrowth perhaps 100 meters from the road. I tried to climb on one of the flues but it was too high so I headed back up. Next I followed the road down. I came across a pack of dogs and because I didn't realize I was in an off limits area I walked right through them with no fear. It's lucky they were useless guard dogs. Looking down on the smelter and the Ying-Yang Sea. This is where minerals from the river meet the ocean. The road ended in a tall fence. I tried to squeeze around the side and climb over but I was so tired by now I felt very unstable. I was also getting the attention of passing cars so I headed right back to the empty mine building shells. On the way I found three Taiwanese people who seemed dressed more for an nice afternoon stroll than off track hiking. They told me the Gold Waterfall route was impossible to pass. I told them I was going to try the tunnels and that with the road sealed these tunnels may well be too. But it beat climbing back up the railway so we tried it. The two tunnels here were built to transport material from the upper mines to the large smelter complex. The first tunnel was unsealed and easy to pass through using phone flashlights. There was a small track on the left after this tunnel that I would have tried had the second tunnel been sealed. The gate at the end of the second tunnel was locked but I could see people at the end. Luckily the people were workers and they had a key. They said the area is being made safe and would eventually be re-opened. I made my way downhill to the Gold Waterfall and then down the road to the coast. I noticed that Shuinandong Smelter had been encircled by a tall fence. The entrance gate still looks easy to get over though and I'm sure there are some other ways in. The entrance to the Benshan Number 7 Mine is inside the smelter complex and can be seen in this blog post. It looks as though it's mostly buried and flooded. Also, according to the same blog, tunnels 8 and 9 were pretty much at sea level and dropped down quite quickly. They are buried under what is now a large car park in front of the smelter. The car park where the 8 and 9 tunnels are buried.